It’s not very often that an excellent Wigan figures painting is offered for sale, so this is a great rare opportunity for someone to be able to acquire such a painting. 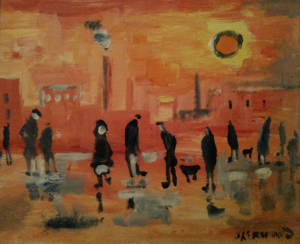 Isherwood is known to have painted in many places, but Wigan remained his favourite place and where he lived most of his life. This excellent example of Isherwood’s work captures the classic style of the artist. The figures he is famous for and also the background that shows the factories and chimneys. There is also the sun, another of Isherwood’s classic features. The colours are vibrant orange in the main, with yellow round the sun and the contrast of the figures. The photograph doesn’t really do the painting justice.